The concept of “being grounded” is becoming a common phrase that is being expressed these days. The connotations associated with “being grounded” are that it is a healthy and beneficial phenomenon. However, what exactly does it mean? The purpose of this article is to explore “grounding” from an electrical, postural, breathing, and emotional perspective. The human body is constantly generating free radicals via oxidative reactions which if unchecked can contribute to immune and inflammatory stress. Anti-oxidants that serve to neutralize these reactive oxygen species do so by donating electrons. The earth’s surface has a net negative electrical charge characterized by an excess of electrons. Therefore, the earth is a natural repository of electrons to supply our bodies with anti-oxidants thus mitigating oxidative stress. However, this ultimately requires direct contact of our skin to the earth or the use of conductive sheets/pads/wrist bands (Earthing products) that are connected to the grounded component of an outlet. Modern living subscribes to a plethora of toxins that we ingest and are exposed to through our foods and environment requiring significant anti-oxidant retaliation. Consider this relative to how the natural human electrical discharge mechanism between the ground and our bodies has become mostly obsolete. Until recently, throughout much of our human existence we walked barefoot and slept on the ground. Our shoes, particularly rubber soled, pose a barrier for this electrical conductance pathway. Furthermore, most of us are walking on artificial surfaces. There are many individuals who never or rarely experience barefoot contact on real earth. This is one of the reasons why walking barefoot on the beach is so enjoyable and relaxing for people. Not only are you experiencing wide open space (in contrast to the typical close-up, indoor, focal work we do on screens) and the natural multi-sensory rhythms of the ocean (as opposed to the artificial dissonance created by modern technological devices) but you are also absorbing electrons from the ground to neutralize free radicals in your body. 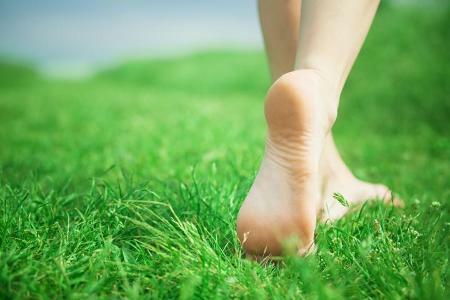 In the Journal of Environmental and Public Health, Chevalier et al (2012) describe in “Earthing: Health Implications of Reconnecting the Human Body to the Earth's Surface Electrons” the numerous health benefits of this phenomena. Such effects of “earthing” that have been demonstrated include beneficial changes related to sleep, pain, cortisol level, autonomic nervous system activity, immune function, osteoporosis, heart rate variability, hypercoagulable blood, and glucose regulation. In addition to personally sleeping on an earthing sheet, as a Physical Therapist I commonly recommend them to my patients, particularly those who are experiencing pain, inflammation, and have difficulty sleeping. Thus far, in addition to myself, my family, friends, and patients have reported significant improvements in these areas since incorporating earthing practices. From a postural perspective, “being grounded” means your body is authentically aware of where the ground is and its positional and gravitational relationship to it. This is the responsibility of our postural system which is primarily comprised of our visual, auditory, vestibular, and sensory-motor systems. Our postural system and essentially all of the systems in our body, work in the realm of patterns. Our brain-body is a dynamic habit centered organism. Furthermore, our neuromuscular system works in patterned “chains.” This means that groups of linked muscles fire together in synergized mechanisms to accomplish our functional needs to be upright against gravity and move. Our primal human essence of movement is walking which is comprised of two polar phases-being on the left leg and being on the right leg. This has an accompanying predictable neuromuscular firing pattern from the foot all the way up to the head including the visual and vestibular systems. Each side is essentially a conjugate of the other with opposite patterns occurring simultaneously. When the left leg is on the ground it is in the “grounded” phase when the right leg is in mid-air, and thus ungrounded. The opposite occurs for the right stance phase of gait. Our postural system is intimately linked with our breathing (respiratory) system. Just like our alternating left/right walking, breathing also exhibits an oscillatory essence characterized by inhalation and exhalation. When we inhale the front of our rib cage elevates into external rotation as the diaphragm contracts and lowers. This is in contrast to exhalation where the front of the rib cage lowers. During exhalation the diaphragm relaxes as it returns to a upward domed position in apposition to the internal surface of the rib cage (referred to as the “zone of apposition”). Authentic and efficient breathing is characterized by being able to alternate between a full inhale when the diaphragm lowers and a full exhale where the diaphragm rises up into apposition with rib cage. This requires synchronized activity between the abdominal and pelvic floor musculature to control pressure and positional relationships throughout the trunk. These same muscular patterns are also involved in managing the process of walking. Therefore, how we breathe effects how we posture and move. Likewise, how we posture and move effects how we breathe. The current trend of postural and breathing dysfunction amongst our modern living society is characterized by being in a chronic state of inhalation. Many of us are functioning in a stressed out mode characterized by excessive sympathetic nervous system activity and holding our breath. Consider what we do when we are startled or experiencing fear-we gasp! This is in contrast to “a sigh of relief” when we exhale into a calm and relaxed state of being. Unfortunately, this inhalation pattern has become a chronic breathing behavioral habit vs an acute transient one (such as if we were startled by a predator as was the case in our paleo times). This means the rib cage is excessively elevated and open in the front, closed in the back, with the diaphragm locked down in a perpetual contracted state, preventing a full exhalation and thus relaxation to occur. This means poor breathing excursion and airflow. It also translates into excessive tension in the psoas, hip flexors, back extensors, and neck musculature as the diaphragm is fascially and functionally connected to these muscle chains. Positionally, this pattern is typically accompanied by an excessive anterior pelvic tilt, lumbar lordosis, protracted scapula, and forward head posture. This is ultimately an “ungrounded” posture. In order to potentiate one’s ability to be “grounded,” one must consider the behavioral, postural, breathing, and emotional dimensions that ultimately create it. Behaviorally, we can increase our electrical contact with the ground either naturally and/or through the use of Earthing products. We can also attempt to reduce our free radical production in that we have some degree of control over the amount of toxins we ingest and are exposed to. By restoring appropriate postural and breathing patterns one can improve their ability to authentically “ground.” The method of the Postural Restoration Institute (PRI) is heavily focused on creating these grounded relationships. An important component to this is to establish a full exhalation to allow the diaphragm to achieve a relaxed domed position in contact with the internal rib cage. Furthermore, because the diaphragm is part of a continuous chain of synergistic muscles from the foot all the way up through the head, a portion of or all of these chains may need to be re-educated to ultimately create this grounded pattern. This typically requires practicing specific postural restoration techniques so that the brain-body can learn a “grounded” pattern. Finally, by addressing fear based emotional patterns one can also influence their breathing, posture, and thus ability to “ground.” Likewise, one can positively influence anxiety and stress via better postural and breathing function. It’s all connected! Chevalier G, Sinatra ST, Oschman JL, Sokal K, Sokal P. Earthing: Health Implications of Reconnecting the Human Body to the Earth’s Surface Electrons. Journal of Environmental and Public Health. 2012;2012:291541. doi:10.1155/2012/291541. I recently received an inquiry from a fellow PRI colleague who was unable to attend this past spring's symposium on the auditory system. The question related to the reasoning behind why one of his client's hearing improved despite a diagnosis of otosclerosis and accompanying prognosis that did not include the ability to get better. Below is my response that I thought was worth sharing with the rest of the PRI community. It was also posted on the Postural Restoration Google Group. If you are not yet a member of this group of practitioners where we have a forum to discuss PRI related topics please email me at HeatherCarrDPT@gmail.com to join. Our ability to "hear" is determined by a number of factors but here are the ones that are applicable to position and movement from a PRI perspective. The inner ear is composed of the cochlea (frequency/sound analyzer) and the vestibule (motion/position analyzer). Our cochlea receives auditory afferent sensory input via sound conduction through the air but also via our bones. The latter is particularly important in relaying the true fundamental tones of sound back to the nervous system. When our bones do not vibrate appropriately it is difficult for us to perceive authentic sound characteristics. The vibrations created by the larynx are transferred to the spine and cranial bones providing important auditory afferentation. Our middle ear is composed of 3 vibrating ossicles (hammer, anvil, stirrup in order from outer to inner) which transmit sound from the outer ear to the inner ear. Therefore, proper vibrational capability of these bones is important for sound conduction. There are two muscles within this complex. The tensor tympani is attached to the hammer and is a flexor. The stapedius is attached to the stirrup and is an extensor. Consistent with PRI's functional perspective of poly-articular chains of muscle, these muscles can also be included in these neuromuscular synergies. Therefore, if there is an excessive degree of extensor facilitation in the the body it will likely translate to the stapedius exhibiting hypertonicity. Likewise, stapedius hypertonicity can impact the rest of the postural extensor system. The same may apply with the tensor tympani. This could be extrapolated a step further when considering the asymmetrical tendencies of the cranial system (R typically more in extension and the L typically more in flexion). Therefore, when the system is not able to spend time in neutrality, it will likely have difficulty producing appropriate neuromuscular tone thus impacting position and vibrational capability of the skeletal system. The position of the larynx is important for sound generation and that forward head patterns, as described in Cervical Revolution, will negatively impact its ability to properly posture and thus vibrate appropriately. Furthermore, the length/tension relationships of the surrounding laryngeal musculature, ligaments, and tendons are concurrently providing additional somatosensory information also contributing to auditory perception. If these relationships are inefficient so will the corresponding sensory input. Let's take this a step further and remember that a huge contributor to the position of the neck is the position and poly-articular patterning coming from the thorax/diaphragm and pelvis. Our diaphragm position exerts signficant control over the exhalation power behind the voice. In summary, our bodies need to have the ability to vibrate. If one is locked into asymmetrical or bilateral patterns that do not allow appropriate range of movement, one's resonance is dampened. This will reduce important sensory input to the system further contributing stress as sensory deficits are ultimately stressors. Part 3 of Human Asymmetry, Lateralization and Alternating Rhythms: How Did Humans Become Asymmetric?